Diamonds live forever, but only when you buy the perfect one. Regardless of the occasion, engagement, anniversary, wedding, birthday, you need to consider many things while buying diamonds. It’s not a matter of prestige, but getting the highest quality for your money. The best way to get the prettiest and highest-quality diamond is to learn a thing or two about them. Scroll down to get informed about diamonds, cuts, and everything else you need to know about a girl’s best friend. A diamond cut is defined as a shape of the stone, design, and style of the diamond. Although to most people all diamonds are the same, the reality is much different. Diamonds come in a plethora of shapes and sizes. While some diamond cuts are brilliant and sparkly, there are also those that are not. Also, some cuts work better when used as a side stone paired with another diamond, but others work entirely on their own. Throughout the history, diamonds and their cuts changed and evolved, and now there are different types of which some have become more popular than others. Different diamond cuts have a different number of facets, ratio, and other features that make them either brilliant or they provide some effects which are described below. Diamonds come in different shapes and cuts meaning you can find an ideal stone to match your needs and preferences. Even though you’re probably expecting one specific answer about the best diamond cut, it would be difficult to pinpoint a particular stone. The reason is simple; every diamond cut has its advantages and some shortcomings, so the choice of the best shape depends on things you like or dislike. Also, trends change all the time. Diamonds that were popular 200 years ago were replaced by more modern choices now, but there are also those that are timeless and never go out of style. For example, you can never go wrong with a princess and round cut. Beauty, like they say, is in the eye of the beholder. Different folks, different strokes. What you choose to be the cut for your life long commitment to someone may be entirely different than the cut that someone else chooses for their bride to be. First, you need to know how diamonds are graded. Most customers, mainly bachelors, feel nervous when buying diamonds because they aren’t sure whether their significant other would like it. There are many factors to consider when buying diamonds, but it’s always useful to start with education. To truly understand diamonds, cuts, brilliance, and other factors you need to learn as much as you can about them. Many online retailers have dedicated sections where potential clients can read and understand everything about diamonds. When you learn a thing or two about cuts, you should take your loved one or someone else’s opinion into consideration. Most people who receive diamonds as a gift have a specific cut they love. While the buyer should determine other factors like cost, insurance, warranty, quality, the choice of a diamond cut should include input from the receiver if possible. If you’re buying a diamond for an engagement ring, then opt for a stone that fits your fiancé’s style. If you’re entirely not sure what diamond cut they like, then go for classic ones that everyone loves, and you won’t have to be stressed out anymore. When you purchase a diamond, you’ll get a diamond certificate. NEVER buy a diamond without a certificate. How Are Diamond Prices Set? Click the link to each page to find out more information about each characteristic. When you blend all of these together, you’ll get the value of the diamond. 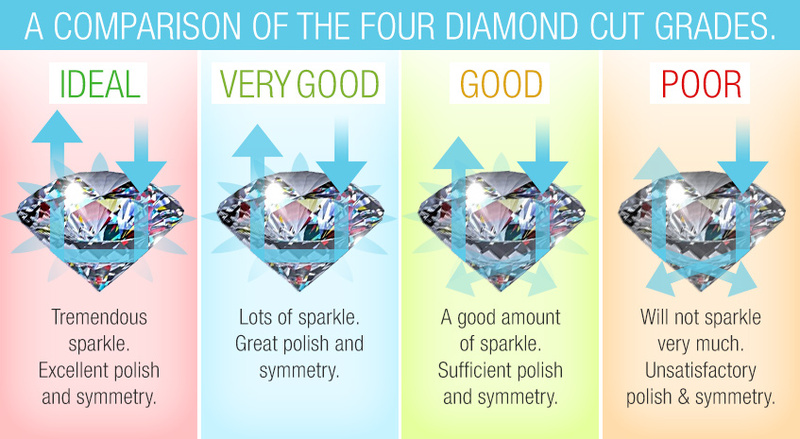 While many people will use the carat as the most important grading factor when purchasing a diamond, the other three characteristics will impact the appearance of the stone much more. Diamond cutting has a long history that can be traced back to the Middle Ages. Before that time, diamonds weren’t used as jewelry, but starting with the Middle Ages things changed, and these stones became a symbol of power, elegance, marriage, and desire. Jewelers began shaping, i.e., cutting diamonds to make them more appealing. Kings used diamonds to woo their mistresses. For many years, these stones were closely tied to monarchies across Europe and other wealthy people. Today, diamonds have become accessible to all. Diamond cutting evolves constantly. As new methods emerge, cutters and jewelers get yet another opportunity to make stones prettier and shinier. In fact, brilliance and sparkle of the diamond depending on the cutting method. Although there are many methods of diamond cutting, they can be divided into two categories: brilliant and a step cut. Brilliant cut is a rough diamond that was cut and polished in stone with outstanding brilliance. At first glance, this stone looks like a very polished cone. On the other hand, step cut is a diamond that has a rectangular or square shape, but facets are arranged parallel to one another. We can divide diamond cuts to several types including: Princess, Cushion, Asscher, Radiant, Emerald, Round, Oval, Marquise, Pear, Half Moon, Triangle, Straight Trillion, Curved Trillion, Calf, and Heart cut. The princess cut is a square-shaped diamond with a rounded top, and it is one of the most popular cut shapes on the market. This particular cut has been created in the 1960s, but the term “princess cut” was used to refer to another diamond, “profile cut,” created by London cutter Arpad Nagy. Many other jewelers and cutters used the term “princess cut” for their diamonds, but the name was made popular in 1979 by Israel Itzkowitz in Israel who is credited as the creator of the “princess cut” we know today. The princess cut diamond has either 57 or 76 facets with an average ratio of 1.0 to 1.5, and it is well-known for its pyramidal shape which reflects light brilliantly thanks to four beveled sides. As a result, princess cut diamonds can be incredibly shiny. Compared to a round cut, princess cut diamonds look larger in size due to the square shape. The princess cut diamonds are a popular choice for engagement diamond rings and earrings. It is important to mention these diamonds tend to be referred to as Square Modified Brilliant on the certificate. Cushion cut diamond has a square or rectangular shape, and its corners are rounded. The sides of these diamonds are curved, not straight and their outline is similar to that of a pillow hence the name cushion cut. This diamond shape has a long history. Similar diamonds appeared in the 1400s, but it took 400 years, in 1800s, for the term pillow cut to be used, but some jewelers also called them candlelight diamonds. In the 1900s, these stones got a more modern name – cushion cut. Since cushion cut diamonds were created before round cut stones, for many years, they were considered a standard. Cushion cut diamond has 58 facets with ratios 1.00-1.05 for square shapes and 1.10 or more for rectangular shapes. Large facets create a greater separation of white light to spectral colors in cushion cut diamonds. Greater dispersion of light through the stone has a purpose of hiding inclusions more efficiently which explains why cushion cut diamonds are more brilliant than a vast majority of rectangular- and square-shaped stones. The Asscher cut diamond shape was created in 1902 by the Asscher Brothers from Holland. There are two types of Asscher cut diamonds: standard Asscher cut and Royal Asscher cut both of which were designed by the same company. The latter is rare. This stone has a unique shape and a prismatic brilliance with a rectangular-faceted pavilion similarly to the emerald cut. Standard Asscher cut diamonds have 50 to 58 facets, but the royal type has up to 74 while the ratio is between 1.00 and 1.05. What makes these diamonds unique is their ability to create the “hall of mirrors” effect thanks to the deep pavilion, high crown, faceted culet, and a small table which allow outstanding luster and create the optical illusion. It’s not uncommon for people to assume Asscher cut and Emerald cut diamonds are the same thing, but they’re not. The main point of difference is the shape. While the top view of Asscher cut is square, the emerald cut has a rectangular top view look. Radiant cut is one of the most beautiful diamond cuts one can find, and it was designed in 1977 by Henry Grossbard from the RCDC (Radiant Cut Diamond Company). Before this diamond shape was created, all diamonds were square cut with lower brilliance. Grossbard invented a hybrid diamond that revolutionized the diamond industry by creating a step-cut stone that is comparable to triangular-faceted diamonds. Radiant cut diamonds genuinely live up to their name thanks to their shine. These diamonds can be rectangular or squared in edges. Rectangular radiant cut stones have ratios between 1.05 and 1.50 while squared stones have ratios between 1.00 and 1.05. Radiant cut diamonds have about 70 facets. Due to its unique shape, radiant cut offers depth and brilliance comparable to princess and emerald cuts. That is why this stone is a popular choice for different jewelry types. Radiant cut diamonds hide inclusions more efficiently than other types of stones. the pavilion, and 25 are found on the crown. Most emerald cut stones have ratios in a range between 1.30 and 1.50, but the most popular ratio is 1.40. If you want a square emerald cut, then you should opt for lower ratios, while higher ratios are the stones of choice for buyers who want a rectangular cut. Compared to other cuts the Emerald cut stone has less brilliance, but its natural crystalline rectangular growth and clarity are highlighted by the broad flat plane. Round cut is the most popular diamond shape. What’s more, about 75% of sold diamonds account for round cut stones. The history of this cut takes us back to the 17th century when jewelers and diamond cutters started using more complex ways to make sure stones look more refined. Three most important types of round cuts are Mazarin cut originating in 1650, Peruzzi cut from 1700, and Tolkowsky cut from 1919. Round cut diamonds have 58 facets divided between girdle, crown, and pavilion. The ratio of this stone ranges between 1.00 and 1.02. Due to the fact that the cut naturally follows diamond crystal, it has an outstanding shine. Round cut diamonds have more brilliance and fire compared to any other shape. Plus, they are the most versatile diamond cut around fit for all types of jewelry and occasions. Round cut is a classic and timeless choice that never goes out of style, and it’s perfect for all buyers, especially bachelors, who aren’t sure what type of diamond to get to their significant other. Oval cut stones belong to the group of the most beautifully cut diamonds that exude elegance and sophistication. Even though oval-ish stones were created about 200 years ago, history of the modern oval cut starts in the 1960s. Lead Russian cutter Lazare Kaplan is credited for creating modern oval diamonds. These stones have a rounded shape with 58 facets on average. The ratio of oval cut diamonds varies from 1.33 and 1.66. Basically, if you want a longer oval shape, then you should opt for a larger ratio while more rounded stones have a smaller ratio. Oval stones elongate fingers while rounded stone minimizes the likelihood of the “bowtie effect.” When light that passes through the stone casts a shadow across central facets, it creates the bowtie effect, which is also found in pear, heart, and marquise cuts. Bearing in mind that oval cut stones are cut in the same fashion as round diamonds, they have a wonderful shine, sparkle, and brilliance. An amazing benefit of oval cut stones is that they look larger than other diamonds of the same weight. Marquise cut, also called Navette or a “little boat,” has elongated and pointed ends with a curved shape that resembles a football. The history of this cut starts in 1745 in Paris and, as you can already imagine, it was closely tied to the French monarchy. King Louis XV of France hired a jeweler to design a diamond that would represent his mistress’ smile. His mistress was Marchioness de Pompadour Jean Antoinette Poisson. The regal stone usually features 58 facets of which 25 are on the pavilion, and 33 are found on the crown. The average ratio of these stones is 2:1, but they are also available in ratio ranges from 1.85 to 2.10. These diamonds are often cut to feature a “French tip” where the star and upper girdle facets replace large bezel facets. Marquise cut stones can sometimes suffer from a bowtie effect. Similarly to oval stones, marquise cut can elongate the finger and appear larger than other diamonds of the same carat weight. In order to avoid bowtie effect, it’s practical to opt for more shallow stone. Half moon also referred to as crescent, cut is a half-oval and half-round shaped diamond with a straight edge. This diamond is commonly used as a side stone which is why it is sold in pairs. Half-moon cut complements other cuts as rectangular, oval, and cushion cut stones perfectly. They also look great when used as a side stone surrounding princess cut diamond. Back in time, half moon cut diamonds were cut from broken oval and round stones. They had a step cut similar to that of triangular stones, but today things are different. Nowadays, half moon stones are cut directly from the rough as jewelers and cutters use similar procedures for shaping round and oval diamonds. The change of a cutting style allows half moon stones to be brighter and sparkly. The ideal ratio for these stones is two because higher values result in a diamond that appears skinny. On the other hand, lower ratio produces a shrunken look. Pear cut diamond is a combination of round and marquise stones. The very first diamond of this kind appeared in the 1400s, and it was created by a Lodewyk van Berquem of Bruges, a Flemish cutter and an inventor of scaif or the diamond-polishing wheel. At first, the term Pendeloque or Briolette Cut was used to refer to these stones. The pear cut diamond usually features 58 facets, and it has a ratio of 1.50 to 1.70. Similarly to marquise diamonds, pear cut stones may come with a French tip and they can suffer from a bowtie effect. The elongated shape of a pear cut diamond creates a slenderizing effect on a finger and makes a wearer’s hands more elegant. Due to a variety of stone widths available, pear cut diamonds belong to the group of the most customizable stones. The ideal pear cut diamond has a rounded base and polished girdle. Triangle, also known as trillion, cut diamonds have a triangular shape and their unique appearance varied through the years. First stones of this kind appeared in the 1400s, but modern-day triangle cut was designed in 1962, and it featured straight sides while another version appeared in 1978 by a jeweler Leon Finker in Amsterdam. The triangle cut diamonds usually feature 31 to 50 facets and a 1.00 ratio. What makes these stones unique is their versatility. Similarly to half moon cut diamonds, triangle-shaped gems can be used as side stones to complement larger ones in the engagement ring or another piece of jewelry. That being said, triangle cut diamonds can also look amazing when using as solitaire stones on their own. Triangle cut diamonds hide inclusions well and have fantastic brilliance. When buying these stones, it’s important to consider depth. Inadequate depth takes away brilliance and sparkle from the stone. Straight trillion cut is, basically, an original form of triangle cut diamond. When triangular stones first appeared, they had straight edges, but more designs have a more curved appearance. Straight trillion cut can have between 31 and 50 facets, but the average number is 44. These stones have a ratio of 1.00; bearing in mind straight trillion stones are cut from a flat and vaguely triangular shaped rough diamond called macles it usually has a relatively shallow depth. It is commonly used as an accent stone. Due to a somewhat shallow depth, straight trillion cut doesn’t sit too high on the finger and is suitable for practical brides who prefer simple jewelry. An amazing advantage of straight trillion cut is that it looks larger than it, actually, is. For this reason, it can be a great choice for bachelors on a budget who still want to make sure their fiancé or wife to be has a large-looking diamond on her finger. Curved trillion cut diamond is, essentially, a curvy variation of triangle stone. These stones are characteristic for modern triangle diamonds mainly because these stones had straight edges in the past. Thanks to its 31 to 50 facets, curved trillion cut has the sparkle that complements the angular shape. The exact number of facets depends on whether curved trillion is used to complement a larger solitaire diamond as a side stone or it is used as a solitaire stone itself. A typical ratio is 1.00. It can work both ways, and this perfect versatility is the reason behind a growing demand for this diamond. Curved stones are employed for solitaires and feature amazing brilliance when cut to a proper depth. Similarly to straight cut trillion, this stone looks bigger than it really is. It can work perfectly in engagement rings, but it is also sold in diamond-studded earrings, solitaire pendant necklaces, and other types of jewelry. Calf cut stone is a modified trapezoid. While the standard trapezoid diamond has four sides with top and bottom parallel while other sides are slanting inward, calf cut has an extra side that makes it more interesting. At first glance, the stone resembles a calf’s head hence the name of this diamond. Calf cut stones are relatively rare which only adds to their uniqueness. While most of them are brilliant cut, some jewelers use a step cut method. The ratio and number of facets depend on the type of the cut used for that particular diamond. These stones are commonly used as complementary stones that accentuate some other center diamond shape. Recently, they gained on popularity. Calf cut is a great alternative to trillion cut stones, and it usually has a greater depth, thus giving more sparkle. If you want more shine, then opt for brilliant cut stones, while step cut works perfectly when used as a side stone with another diamond that was also step cut. 16th century. The first exact record associated with this diamond dates back to the 17th century, 1605, when it appeared in a portrait “The Gonzaga Princess” painted by Frans Pourbus junior. In the 1900s, heart cut diamonds get the modern-day shape that is still used. The heart-shaped diamond has 56 to 58 facets and a ratio between 0.90 and 1.10. These stones may have French tips, and they can suffer from a bowtie effect. When buying heart cut diamonds, the most important thing to consider is quality of the curved cut. The quality of curved cut determines the brilliance and sparkle of the stone. Only talented jewelers and cutters have necessary skills to make these gems have a heart-shaped curvature that makes them look so pretty. Buying diamonds needs not to be a frustrating experience. With the evolution of technology and internet, it was only a matter of time someone would decide to sell diamonds online. Today, there are numerous online stores which allow customers to find and buy diamonds or design a unique piece of jewelry. Buying diamonds online has become a better way of purchasing these gems than walking into a store, and the reason is simple – greater transparency. Now that you know what factors to consider prior to buying an engagement ring let’s take a look at the most reputable retailer. James Allen is an American online jewelry retailer well-known for the amazing collection of diamonds. Oded Edelman, Michelle Sigler, Dean Lederman, and James Schultz founded the company in 2006 in New York, and the rest is history. As we mention in our James Allen review, they truly revolutionized the diamond-selling and jewelry industry by making it easier for buyers to purchase and afford high-quality diamonds. The company has more than 150,000 certified diamonds in their vast offer. What’s more, all diamonds come with a lifetime warranty, money-back guarantee, and free shipping worldwide. James Allen provides a wonderful selection of different cuts and shapes such as round, princess, cushion, emerald, oval, radiant, Asscher, marquise, heart, and pear. Multiple diamond colors are available in their offer such as yellow, pink, purple, red, blue, green, orange, brown, black, and gray. To make it easier for customers to buy diamonds, James Allen arranged different financing options including deferred interest if paid in full within six months and 9.90% APR with 24 monthly payments. The Blue Nile is a USA-based online jewelry retailer founded in 1999 in Seattle, Washington. The primary goal of the company is to make diamond shopping a smooth and seamless experience. At the very beginning they sold engagement jewelry only, but today their offer expands to earrings, necklaces, bracelets, rings, and others. As we mention in the Blue Nile review, their diamonds come in all sorts of shapes, similarly to stones on James Allen website, such as heart, pear, round, princess, oval, radiant, cushion, Asscher, emerald, and marquise. For those who want their diamonds to be unique, different colors are available such as orange, yellow, green, gray, blue, purple, red, pink, and brown. The Blue Nile website also aims to educate customers, and their website features articles that help potential buyers learn more about diamonds so they can get the best stone for their budget. All diamonds are ethically-sourced and come with a lifetime warranty. The company offers competitive financing for US customers through Blue Nile credit card. Brian Gavin is a fifth-generation diamond cutter from South Africa. Gavin has his own online diamond retail store which provides engagement rings, wedding bands, earrings, studs, pendants, bracelets, and other types of jewelry. The signature diamond collection features round, cushion, princess, Asscher, emerald, oval, radiant, pear, heart, and marquise stones. Brian Gavin online store also strives to educate, and a special section on the website comes with useful posts that help customers get to know diamonds before buying them. The store only sells diamonds that are AGS and GIA certified. All stones are conflict-free, which we mentioned in our full Brian Gavin Diamonds review. They also offer lifetime upgrade policy on all Brian Gavin signature diamonds. Bear in mind the lifetime upgrade policy doesn’t apply to jewelry that contains diamonds already. Regarding financing, Brian Gavin partnered up with Affirm to provide instant credit checks and 3-12 month financing for US- and Canada-based (except Quebec) customers. Customers also have the option to pay for diamonds with two credit cards if they wish.